If you asked a room full of people to name the top 10 rock & roll bands of all time, chances are that KISS would probably not make the list. Ask those same people to name the top 10 rock & roll marketers of all time, and chances are KISS would top the list. On the latter, there is no argument: over 100 million albums sold worldwide, broken box office records previously held by the Beatles and Elvis, and an appearance at Super Bowl XXXIII and the Olympics in 2002. Forty years in the business and they are still going, appealing to an entirely different generation. Add to these accomplishments 2,500 licensed products with north of $500 million in sales, and KISS qualifies as an empire with a billion-dollar brand. It all started very humbly in 1973. New Yorkers Paul Stanley, Gene Simmons and Peter Criss were playing local clubs as Wicked Lester. In January, they auditioned and took on Ace Frehley as their lead guitarist, changing the band’s name to KISS shortly afterwards. Frehley is credited with creating the now famous KISS logo. What the band lacked in critical acclaim, they more than made up for in live performances. They created ‘personas’: Ace Frehley was the “Spaceman”, Gene Simmons the “The Demon”, Peter Criss the “Catman”, and Paul Stanley “Starchild”. The band used a generous combination of pyrotechnics and special effects with well choreographed theatrics to create the ultimate live experience, and quickly grew a loyal following known as the KISS Army. When Simmons and Stanley realized that it was the personas that the fans built a bond with, they became storytellers, expanding their characters’ backgrounds and how they met. KISS would not appear again in public without their make-up until 1983. This is exactly what made the group so immediately powerful, and what no doubt has contributed greatly to their enormous longevity. Essentially, it’s not Simmons, Stanley, Criss or Frehley who are the true members of KISS; it’s the characters who make up the band. And unlike their flesh-and-blood counterparts, these characters never age, never get tired; they don’t have drug problems, day jobs, spouses, or joint pain. They exist entirely within one dimension and with one sole purpose: to deliver a great brand experience. On June 28, 1977, Marvel Comics published a KISS comic book. The red ink used supposedly contained a small amount of blood from the band members themselves. It sold over 400,000 copies. In the fall of 1978 NBC broadcast a feature-length animated cartoon entitled ‘Kiss Meets the Phantom of the Park’, and Marvel issued a second KISS comic. Simmons became an avid student of branding and merchandising, constantly poring over industry trade journals. He knew to leverage every promotion opportunity to enhance the story and persona of KISS, culminating with their dramatically staged “unveiling” on MTV in 1983. KISS was disciplined when it came to the band’s image, constantly reinforcing the personas as the band, and the positioning line they adopted. Before every single concert the band would announce “You came to see the best, now you’ve got the best!” They defined themselves before others could do it. A valuable lesson for any company or brand. The KISS brand was so effective, ardent fans would have the band’s logo tattooed on their bodies. What company in the world would not wish their customers were so dedicated? 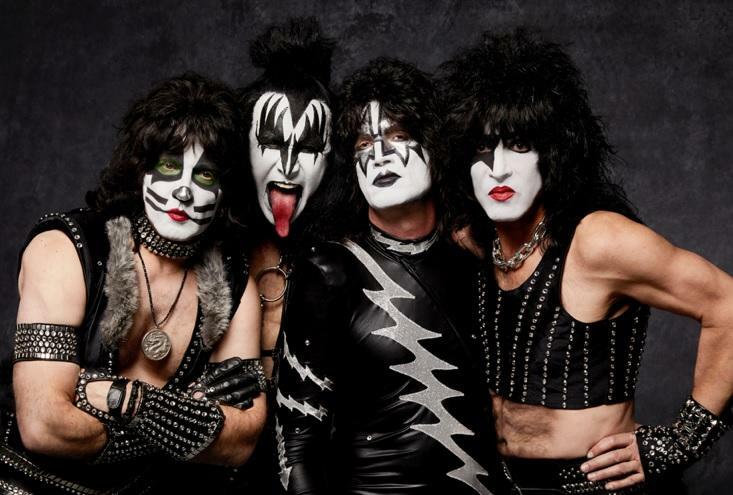 Ironically, the band’s branding strategy can be summed up by their name: KISS. Keep it simple, stupid. Know that the brand is built on a compelling story. Define yourself before others do. Don’t be afraid to piss people off. Know your customer and be consistent in your delivery. Be proud of your mission and values. Leverage partnerships and opportunities that support your brand. Remember that a good brand is memorable. The band’s legacy is ensured by the savvy merchandising of its instantly recognizable, cartoonish image, which has inspired pinball games, plastic action figures, condoms – all the way up to the $4,000 KISS Koffin that fans can purchase to move on to the next rock & roll life. However, it was their intimate understanding of storytelling and maintaining the integrity of their personas that cemented KISS as one of the all-time best marketed brands.